A 50-year-old man accused of using a pair of scissors to fatally stab a woman he briefly dated and then killing her dog before setting fire to her Pomona apartment made his initial court appearance Monday on murder and other charges. 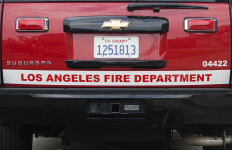 Chaumon Tyner, of Inglewood, is facing one count each of murder, animal cruelty and arson of an inhabited structure in the March 18 killing of 58-year-old Ronny Wall. Tyner was arrested March 27 and charges were filed two days later. He is being held in lieu of $2.45 million bail pending arraignment, which was rescheduled to May 2. At 7 a.m. on March 18, Pomona police responded to a call from Los Angeles County firefighters of a suspicious death inside a unit at the Serenity Villas Apartments, a senior living facility at 150 E. Bonita Ave.
Wall and her dog were found dead inside the apartment and investigators found obvious signs of a struggle, as well as evidence of an arson fire, according to police. Wall had suffered several stab wounds to her upper body and been physically assaulted, Pomona police Sgt. Jon Edson said. Prosecutors allege Tyner ransacked the apartment before starting the fire and then fled in Wall’s car. The apartment’s sprinkler system extinguished the fire. Tyner was previously convicted of multiple felonies, including robbery, burglary and grand theft, according to the District Attorney’s Office. If convicted as charged, he faces a maximum sentence of more than 76 years to life in prison.